Add a boost of caffeine to your next happy hour with the best espresso martini. Our simple recipe only requires 5 ingredients. Stir together sugar and instant espresso in a small bowl until combined. Pour mixture onto a small plate or saucer. Wet the rim of a martini glass, and rim with the espresso sugar. Set aside. Fill a cocktail shaker with ice. 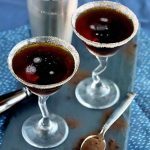 Pour in espresso, vodka, and coffee liqueur. Shake well, for about 30 seconds to 1 minute. Strain into the rimmed martini glass and serve. For a vanilla version, try vanilla-infused vodka. Yum!